Buddhist monk Xuecheng, shown here at a conference in 2014, has resigned from his post after sexual misconduct allegations. According to the South China Morning Post, the allegations came from a 95-page report written by two of the monastery's former monks and posted on social media. 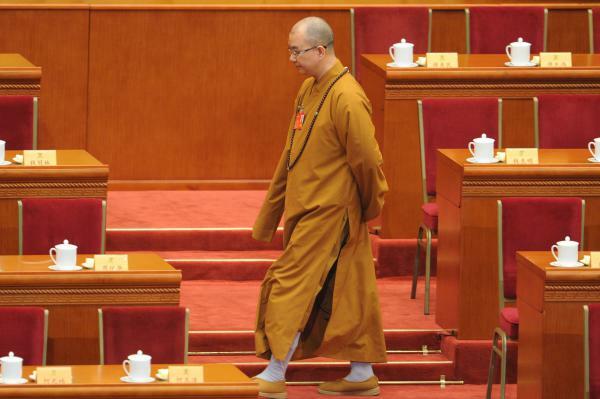 The report alleged that the abbot "sent suggestive messages to two female monks at Longquan Temple and made unwanted sexual advances towards at least four others," the newspaper reports. "Other chapters outlined how he had overseen the illegal construction of several buildings at the monastery and embezzled funds." "Longquan temple is under his spell ... Xuecheng manipulated disciples to serve his 'Buddhist empire,'" the report states, according to the BBC. One of the report's authors, Monk Xianqi , told the broadcaster that they didn't intend to make it public and didn't know how it leaked. The monks had submitted the report to the police, the AP reported. Chinese authorities had started looking into the report's claims. "China's top religious authority launched an investigation shortly after the allegations were made public," Agence France-Presse reported. The news of Xuecheng's resignation was mid-way through a long account of the Wednesday council meeting. The account doesn't state the reason why the senior monk is leaving his post. In the U.S., the #MeToo movement has seen many powerful men across multiple industries lose their jobs and reputations after allegations of sexual misconduct. NPR is among those organizations that have fired or suspended male executives accused of harassment. #MeToo has had a smaller, but tangible, impact in China. According to the BBC, a professor was accused of sexual harassment in January and was later fired. "Since then, a veteran journalist, the founder of a prominent charity and another academic have figured among the accused public figures."